Even if carbon dioxide levels stopped rising today, the world would still warm by 1.6 °C above pre-industrial levels –which is more than three-quarters of the way to the 2 °C limit the world is supposed to be aiming for. That is the implication of two sets of figures announced on Monday. Global average levels of carbon dioxide in the atmosphere temporarily broke the 400 parts per million level earlier this year for the first time, the World Meteorological Organization said. Climate models show that even if CO2 levels stopped rising, the world would still warm by around 0.6 °C. So the latest figures mean that even if the world slashed emissions by 60 per cent immediately, which is what it would take to stabilise CO2 levels, we would still hit 1.6 °C. Even if countries stick to what they are proposing to do as part of the global climate treaty now being negotiated, emissions and CO2 levels will continue to climb well past 2030. 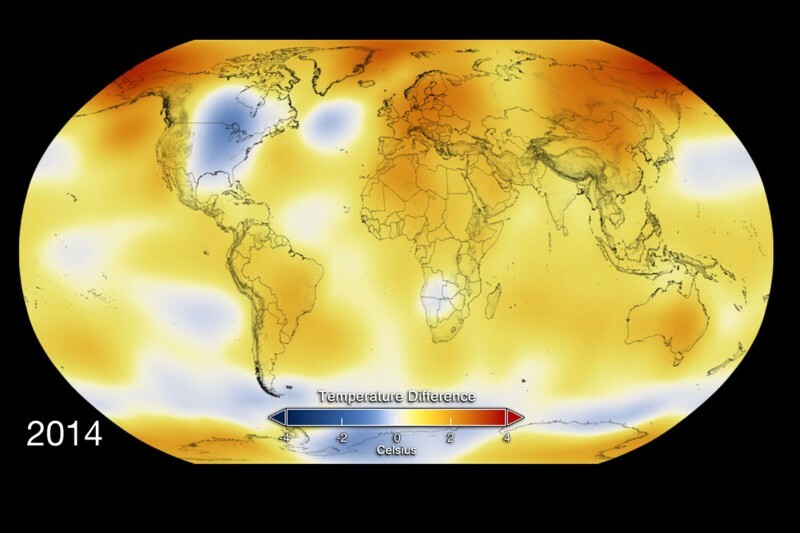 It therefore appears unlikely that warming can be limited to 2 °C. An ice sheet model predicts that the sea level rise from ice melt contribution is most likely to be 10 cm of sea-level rise this century under a mid to high climate scenario, but is extremely unlikely to be higher than 30 cm. When combined with other contributions, that’s a significant challenge for adapting to future sea level rise. But it’s also far lower than some previous estimates, which were as high as one metre from Antarctica alone. The study’s central estimate raises the Intergovernmental Panel on Climate Change (IPCC) central prediction of 60 cm global sea-level rise by just a few centimetres under the mid to high scenario they used. But the UK and France team’s method allowed them to assess the likelihood of sea-level rise from substantial parts of the ice sheet collapsing, which the IPCC could not due to a lack of evidence. They predict there is a one in twenty chance that Antarctic collapse could contribute more than 30 cm sea-level rise by the end of the century and more than 72 cm by 2200. This does not rule out larger contributions on longer time scales. 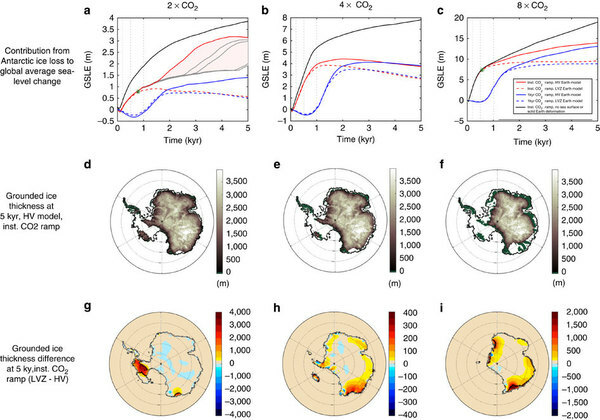 The control run for the case of a 2 × CO2 emissions scenario is characterized by a loss of ~2.8 million km3 of ice by the end of the simulation, which corresponds to a global average sea-level equivalent (GSLE; which we define at a given time as the globally averaged sea-level rise after all solid surface depressions, that is, negative topography, left behind by marine sectors freed of ice at that time in the model simulation, are filled with melt water) of 3.8 m (Fig. 1a, black line). About half of this GSLE rise (1.9 m) is reached after just 1 kyr. When the sea-level feedback is incorporated into the simulation, the sea-level rise is reduced by ~50% after 200 years, 500 years and 1000 years, and by ~20%, to 3.1 meters, after 5000 yrs. The stability of marine sectors of the Antarctic Ice Sheet (AIS) in a warming climate has been identified as the largest source of uncertainty in projections of future sea-level rise. Sea-level fall near the grounding line of a retreating marine ice sheet has a stabilizing influence on the ice sheets, and previous studies have established the importance of this feedback on ice age AIS evolution. Here we use a coupled ice sheet–sea-level model to investigate the impact of the feedback mechanism on future AIS retreat over centennial and millennial timescales for a range of emission scenarios. We show that the combination of bedrock uplift and sea-surface drop associated with ice-sheet retreat significantly reduces AIS mass loss relative to a simulation without these effects included. Sensitivity analyses show that the stabilization tends to be greatest for lower emission scenarios and Earth models characterized by a thin elastic lithosphere and low-viscosity upper mantle, as is the case for West Antarctica.